The Committee were delighted to launch its very own wetland guide for Ireland back in May 2018. The manual was developed from a project previously commissioned by Scotland & Northern Ireland Forum for Environmental Research (SNIFFER) and funded by the Scottish Environment Protection agency (SEPA), and the IRWC is deeply grateful to the Director of SNIFFER, Dr Ruth Wolstenholme, and Dr Anna Beswick, SNIFFER, for permission to use an editable version of their original manual as a template for developing the current work, suited to Irish wetlands. 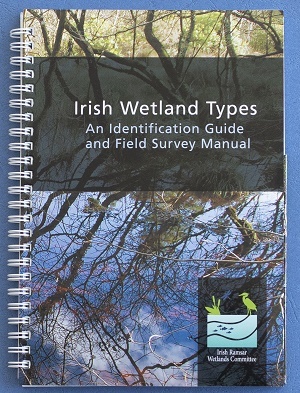 This Irish version of the manual was produced by the Irish Ramsar Wetlands Committee (IRWC) and published by the Environmental Protection Agency (EPA). The principal objective was to provide information for the non-specialist about the different types of wetlands in Ireland and how to identify them in the field. Clearly identifiable wetlands, such as rivers and lakes, are not specifically described in this guide. Rather, there is a focus on the types that are more difficult to define, and the typology is designed to enable a basic identification of wetlands in the field, by people who may not necessarily have ecological, hydrological or hydrogeological expertise. The guide is conveniently sized for taking into the field. It is 92 pages long, illustrated with lots of high-quality images. A PDF version is available here. You may also download the FIELD SURVEY FORM separately.